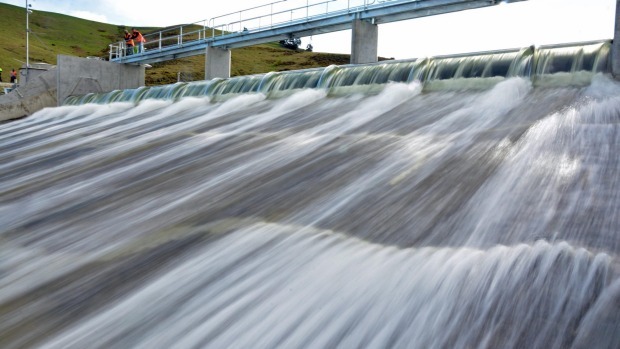 Due to high levels of didymo in the Opuha Gorge and high levels of phormidium further down in the Opuha and Opihi Rivers, along with some operational imperatives, we have decided that a flushing flow release from the Downstream Weir is warranted. Our consent requires us to step up the river flow from 3.5 cumecs to 7.5 cumecs between February to March and we have found that this step change alone can create operational problems with didymo being scoured from the gorge and coming down the river and into our intakes over the following week. We have found it better to precede the change in monthly flow regime with a concentrated flush to remove the nuisance didymo and algae from the river system altogether. The plan at this stage is for the flush, which will start with a 70 cumec release, to begin on the afternoon of Tuesday the 28th of February. After the initial peak flow release, we will attempt to maintain elevated flows (30 cumecs down to 16 cumecs) for the next 8-10 hours. With a travel time of around 12 hours to Pleasant Point, this will mean that river flows will remain elevated right through Wednesday. The 70 cumec peak flow will attenuate significantly once it comes through Skipton and moves down the river. As has been seen in previous flushes, the river will become significantly discoloured and bring some debris with it. Due to this we will be closing down the irrigation schemes while the flush flow passes the intakes. The main reasons behind this is to prevent large quantities of silt entering the scheme races and due to certain consent conditions. Please find below the estimated timings of when each scheme will be shut down, and we will do our very best to minimise the disruption to irrigation. Pipeline (Opuha River to Kakahu River) valve closed at midday. We will work on having water in the Kakahu River and into the Main Race by 0600hrs on Wednesday the 1st March. Irrigators can continue running until the race is out of water. Intake re-opened at approx. 2200hrs on Tuesday 28th Feb.
Intake closed 1900hrs on Tuesday 28th Feb.
Irrigators can continue until race runs dry. Intake Re-opened 0700hrs on Wednesday the 1st March and all efforts will be made to get everyone started that day. Please also note that the river flows will obviously be changing dramatically through this exercise and we would appreciate your assistance in ensuring recreational river users and those property owners adjacent to the river are aware of this. The critical period will be from 5pm Tuesday (high flow at Skipton Bridge) and for the following 18-24 hours. I do apologise for the relatively short notice any inconvenience caused and all efforts will be made to ensure everyone is back up and running as fast as possible. For any further information, please contact me directly.